Waking up, I was happy that we were finally leaving Laos to cross into Cambodia after all the money troubles the last couple of days. Laos has been amazing and completely different to Thailand. And I would absolutely come back to Luang Prabang and Vang Vieng in the future. Eyes ahead, it was the turn of Cambodia but first we needed to cross there! Packing my bag, and after a shower, I headed off for some orange juice while I checked the wifi to see if I got a message from Alannah to find out where she would be staying in Siam Reap, I indeed got one. Turns out she had an horrendous journey, she explained, as both ATMs at the Lao side (which I visited yesterday) and the Cambodian side were out of order, so she couldn’t get her passport back and have access to money til 7pm. Turns out, she was lent money the same as us for her visa. the plot thickens. This worried me as I wondered if we would be in the same situation today. Walking back to the bungalows reluctantly to share the news with Matt and Muriel, I spotted Matt on the porch of the bungalow who looked shifty. I called out to him if he was okay and he replied back but I couldn’t hear him but lip read a word ‘broke‘. What? I rushed around the bungalow to find the rude, unsmiling pregnant owner milling around with a man waiting at the bottom of the steps of the bungalow. They shouted at me as I went past them and went upstairs. Matt said that the sink in the outside bathroom fell off and broke into tiny pieces when he put his hand on it while he brushed his teeth. The owner heard and rushed over and said she wanted 350,000 kip (£35) to replace the sink. Since then, Matt said that he had no money and couldn’t afford to pay for it and he was replied with that he would have to go to the ATM. We knew that the ATM was out of order so that was out of the question. Also, I said that it wasn’t Matt’s fault for breaking the sink as the sink would have been really loose for that to happen. I said, it would be their fault as we shouldered our backpacks as we needed to get the boat across to the bus in 20 mins and we had no time to negotiate. Muriel joined us and as we went downstairs, the rude, unsmiling pregnant woman was joined by another man and she wailed at us for leaving without paying. I calmly told her that it wasn’t Matt’s fault and the sink was already broken. But she jumped up on Matt’s backpack and held on while the man threateningly said we would have to go to ATM to pay. I explained again but I was wary as I saw him wielding a machete the day before and before we knew, we were at a stalemate. The man said he would take Matt in his boat to ATM but I said no, as we had a bus to catch. He became more threatening, and I became anxious to ensure that we get on the bus as we couldn’t afford to miss it, I looked at Matt and said if it was okay if he would pay me back if I used my emergency money. I waved a £20 note and the man was still not happy after he found out what was the exchange rate from a friend of his as we walked off and wanted more money. I lied and told him I had no more money and that the ATM is broken. He said I would have to go to Pakse to get more money. I carried on walking with Matt and Muriel ignoring this but his friends suddenly came running out and surrounded us. Accepting defeat and didn’t want to get into a situation that has everyone turning on us, I threw another £15 at him and stormed off. I called him a swindler and cursed him. It was very saddening to leave Laos on a bitter note and that we had been swindled out by the only aggressive people we met in Laos. Shame on them for spoiling our view of Lao people as friendly. Telling Matt and Muriel to forget about the experience immediately as we travelled across the Mekong river as we wanted to enjoy the journey to Cambodia, we decided to check out the ATM by the off chance. It seemed that Lady Luck had decided to smile on us and hey presto! The ATM was working! 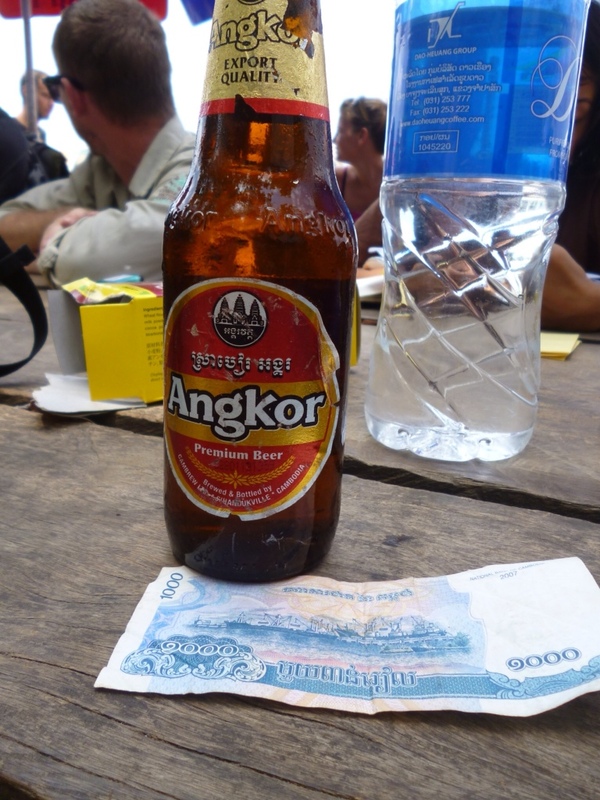 Doing a celebratory dance, we each drew out Lao money enough to pay back the travel agent and buy some food for the journey. With smiles plastered across out faces from ear to ear, we got to the meeting point and immediately paid for our bus ticket and visa without having to be charged for the service. Woo woo! Filling out our Visas to Cambodia as both me and Matt were to join Alannah in Siam Reap and Muriel was to check out Kratie as it’s the place to see the best sunsets in the world, we grabbed some food and iced coffees for the short bus journey to the border. It was pretty painless and didn’t take as long as the Thai-Laos crossing. The only thing that was different was that we had to be checked for a temperature as there is a flu epidemic in Cambodia. Luckily, I was okay and they passed me through. Waiting for our passports to be returned from our travel agent, we played cards with an American couple who overstayed in Laos on their visa by 2 days that caused the delay. But I didn’t mind, I was so happy to be in Cambodia! The travel agent returned our passports after processing them through immigration but he had one passport left that was unclaimed. We gave our passports to him at the Thai border town so is she stranded in the Thai border town without a passport? Someone remarked that she was seen climbing in one of the minibuses that was due to be taken to the border but no one else could remember. We all searched the area for her and still nothing. The travel agent even jumped on a motorbike and checked the Thai border town but she was nowhere to be seen. After a fruitless hour, we saw a waving figure in the distance in no man’s land. It was her! Apparently, she got on a minibus that was not going to the border and stayed stationary by herself. 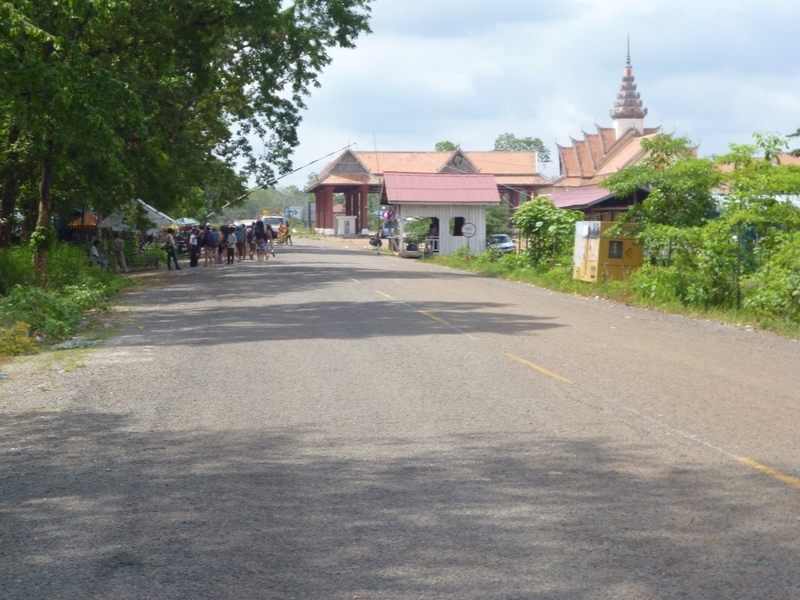 As she asked around, the people realised that she was left behind and gave her a lift on a motorbike to the border, she walked through the Lao border but the Cambodians refused to let her in as she had no passport as we had it. We rushed over and gave her the passport over the barrier and luckily she could get through. A very tense moment for her! We finally got on a bus from the Cambodian border to Stung Treng for people to draw out some dollars to pay back the travel agent. Muriel, Matt and I were lucky to have paid before we crossed as apparently there were ludicrous charges made for lending the money. The bus journey passed without note as I admired the flat scenery of Cambodia from the fantastic bus SE were on as this was highly luxurious compared to Lao local buses. 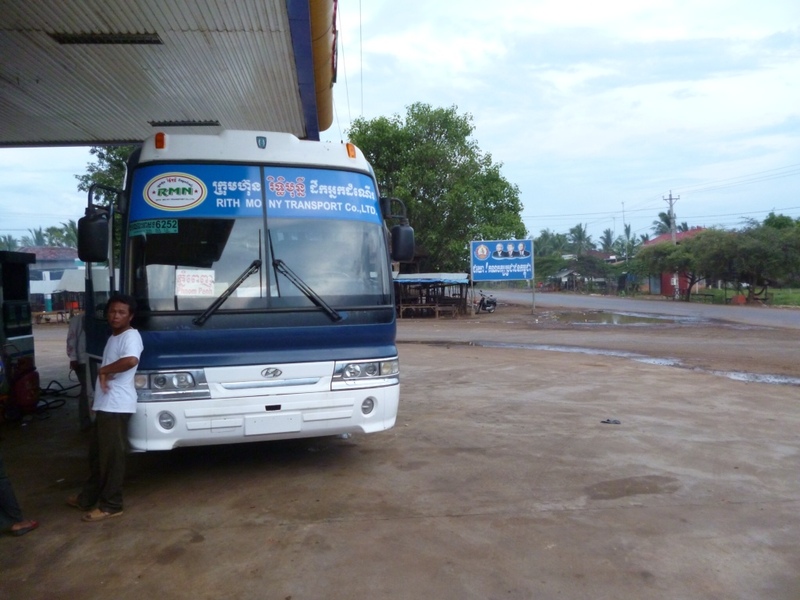 We arrived near Phnom Penh, capital of Cambodia, and we had to change buses at a random place. I still can’t get over that there are no bus stops just cafes where buses stop at. This bus wasn’t as luxurious as the previous bus and my seat actually moved sideways as I sat on it. But managed to get to sleep. This would be the last part of the 16 hour bus journey and I was pretty keen to get to Siam Reap to chill. We were woken up 20 minutes before we arrived by one of the bus attendants who tried to sell us a place to stay in Siam Reap. I hardly understood him as he had a face mask over his mouth, to stop breathing in fumes, and I couldn’t lip read him. Anyway, I wasn’t gonna go to his place as Alannah told me in her message where she was staying and we were going to stay there. Getting off the bus, the city was pitch black as it was 1am and we were jumped on by a load of tuk tuk drivers wanting us to go with them. Picked one out wearily, and told him where to go. He took us to another place. I strongly refused and told him to take us to where we wanted to go and he did in the end finally. We rocked up at the ‘Win It’ Hostel, and signed in for one night and collapsed in bed after a shower and promptly fell asleep. We were finally in Cambodia after the last 5 days!